Creators of the immersive Ferrymead ghost stories, Riccarton house adventure tours, stage shows The Woman in Black and Turn of the Screw present their new immersive show! We celebrate re-opening of the beautiful Old Stone House (1870), one of the Christchurch heritage landmarks, after earthquake repairs - this is an excellent opportunity to tour this historical venue and experience one-of-a-kind live theatre performance in Christchurch. ...As dusk falls on the Old Stone House in Cracroft, NO Productions Theatre invites you to join a popular 19th century literary salon during the Halloween season. Enjoy the delightful horror of Edgar Alan Poe’s tales performed in soft candlelight by expert storytellers. It is 1880, Christchurch, and the newly-arrived Lord Ravencourt (Michael Adams), patron of the arts, has secured the services of the famous Mr Allen (David Allen) to provide tonight’s entertainment... But everything is not as it seems. As the night grows darker, so do the stories. Guests will travel through the Old Stone House to encounter ghosts and the secrets that lurk in its shadows. 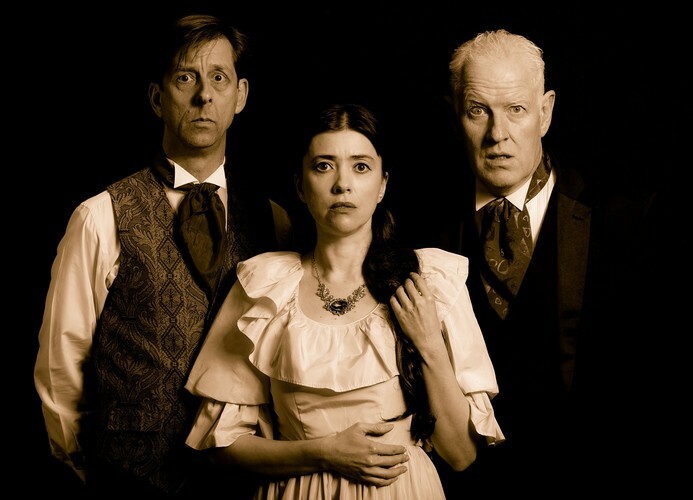 Written by Nataliya Oryshchuk, David Allen and Edgar Allan Poe, this show will be touring New Zealand in 2019. Light refreshments and live piano music (Elizabeth Woods) are included in the ticket price. Seats strictly limited to 35. Evening attire might be appropriate. ...And don't forget to check out our (very) special pop-up Halloween version of this show at Little Andromeda on 31 October at 8pm!